Our range of products include ridge ventilator for ware houses. 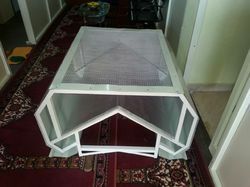 We are successfully ranked amongst the top manufacturer, trader and suppliers of Ridge Ventilator. This vent is installed at the sloped roof which eliminate warm, air from building's attic, these ridge vents are manufactured by our proficient professionals utilizing the optimum quality material and advance technology. Customers can avail these ridge vents in numerous specifications that can be also be customized as per the requirements of the client. Looking for Ridge Vent ?